Home ❯ Articles ❯ Is this the tipping point, as FF and FG support level? For the first time in almost five years of monthly RED C polling, Fianna Fail support has matched that of Fine Gael. Both parties secure 26% of the first preference vote in today’s poll, with Fine Gael losing support (-2%) and Fianna Fail (+1) gaining. Last month I wondered how Fianna Fail would manage to push on from its current position, as support for Fine Gael had remained steady at 28% for five months, despite a number of possible controversies that could have impacted on voters desire to support them. So what has happened in the past month that could have finally dented this support? The poll itself was taken at the centre of the storm regarding Alan Shatters use of potentially confidential Garda information in regard to Mick Wallace use of a mobile phone when driving. At the same time, most voters have also had to finally register and pay the property tax return in the past four weeks. Plus the abortion legislation arguments between Fine Gael TD’s continue to roll on. Any one or a combination of these factors could be to blame for their drop in support this month. Whichever factor has led to the decline, the floor of support we had seen in previous months has been breached. If we analyse voter support since the last election there is no doubt that the government parties have lost support as voters become disillusioned with them mid-term between elections. There is nothing particularly unusual about this trend that occurs both in Ireland and across the world for political parties in power. The more interesting thing happening in Ireland, is that the disillusioned voter has returned to Fianna Fail, when many felt the party would be in the wilderness for several years to come, after the relative thrashing the electorate gave the party at the 2011 general election. What is often forgotten is that many of those that voted for Fine Gael and Labour in 2011, had previously been die hard Fianna Fail voters. When a voter becomes disillusioned with the party they supported at the election, they look around for a new home for their vote. The choice these disillusioned voters had on offer in opposition was either a return to Fianna Fail, or a move to Sinn Fein, Independent candidates or one of the smaller parties such as the Socialist or Green Party. During the first year after the election, the idea of going back to Fianna Fail was unheard of; they simply had not been punished enough. As such many voters, despite being disillusioned stuck with the government parties. 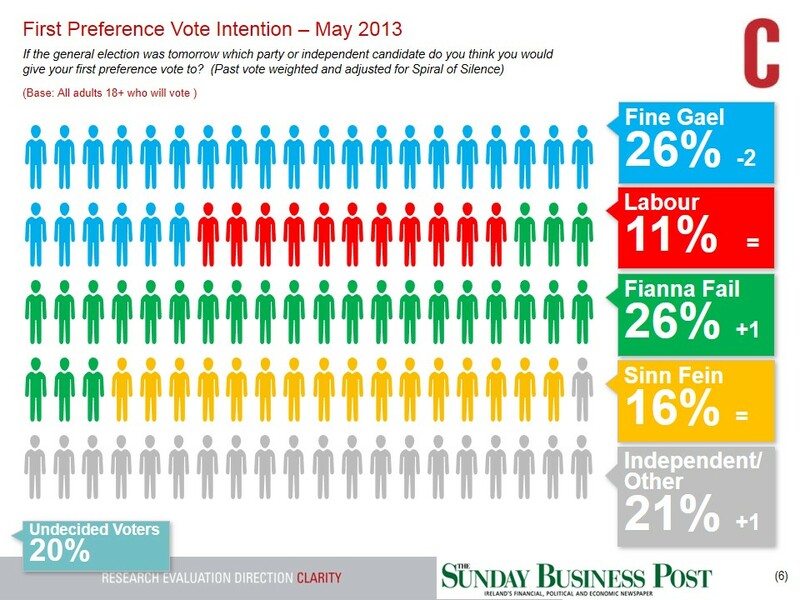 Some did switch to Sinn Fein, and their support remains at a higher level (16%) than seen at the last election. But for many voters crossing to Sinn Fein, remains a bridge too far. Some also moved their support to Independent candidates as is often the case at mid-term between elections. But at heart, many of these disillusioned voters still had a connection with Fianna Fail. As such, in the past year they began to move back to the party. The result is to give Fianna Fail credence as an alternative, and this has seen their support rise consistently over the past year, as many previous and new voters see them as the only credible alternative government party. The last time the two party’s saw their share of support at the same level back in Oct 2008, Fianna Fail support was on the wane and Fine Gael in the ascendancy. A year later Fine Gael support was 10% higher than Fianna Fail. The question now is if Fianna Fail can retain this momentum and drive support upwards at Fine Gaels expense or if Fine Gael can fight back. Some argue that the only reason Fianna Fail have made gains in the past year is the lack of a credible alternative. They cite high levels of Undecided Voters, and the fact that people are going back to a party they should still be annoyed with, as evidence of an opportunity for a new party to emerge. I am not convinced by this argument. Before analysing undecided voters, you really do need to remove those that don’t vote. Some pollsters don’t do this, but by not doing so you are effectively suggesting that everyone goes to vote, which we clearly know from turnout figures they don’t. The fact is that once those who definitely will not vote are excluded, this most recent RED C poll saw the levels of “undecided” voters stand at 20%. This current level of undecided voters is quite high, but we have seen it at or close to this level on several occasions in the past, particularly mid-way between elections, while just before the last General Election it was still standing at 15%. Also, the fact is that many of those that claim to be going back reluctantly to Fianna Fail, actually have a history of supporting them for years before. Looking at those that claim to be undecided in today’s poll, 63% voted for government parties at the last election. At the same time 40% voted for Fianna Fail in 2007. I asked last month what Fianna Fail needed to do to break through the apparently solid support Fine Gael had been retaining for several months. Today’s poll suggest that might not be as difficult as I had envisaged, perhaps the question should now be what Fine Gael can do to stop their support falling any further?